There are a great many things which, in the ’90s, appeared utterly brilliant: velvet trousers, crimped hair, neon clothes, Tony Blair, Sunny D, furbies, to name but a few. And yet, with the benefit of hindsight (and a dash of good taste), you find yourself repeating on loop the phrase “what was I THINKING!?”. And here’s the part where I admit that my favourite driver is none other than … Johnny Herbert. I began watching F1 as a child in the 90s, and Johnny Herbert’s F1 career spanned the entirety of the 90s decade. Being inexplicably patriotic as a child, I think I must have surveyed the British drivers available for the position of No 1 favourite driver: Nigel Mansell was out of the running due to his alarming facial hair, Eddie Irvine was Irish (which didn’t count), Damon Hill was a bit uninspiring and the not-so-British Gerhard Berger was unfortunately Austrian (but had a rocking name) so all in all that left me with Herbert. 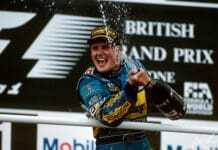 I wasn’t often rewarded as a Herbert fan, but in 1995 I was treated to a win at the British grand prix. You can see Johnny in action at the 1995 British grand prix in the video below. It was around this time that I got two little fan-tailed goldfish – one of which I named Johnny Herbert (because all goldfish need full names, naturally) in honour of my favourite driver. Although, to put it in perspective, I named the other goldfish Catherine of Aragon (one of Henry VIII’s wives). Go figure. These days, if you have Sky you’ll recognise Johnny as part of the Sky F1 team as an Expert Analyst. He’s alright, does the job. But then again anyone looks like a genius next to Simon Lazenby. Johnny Herbert was not the best driver of all time, he wasn’t even the best British driver of all time. But what I most liked about Herbert was what I love most about British sport – the underdog who surprises everyone with a sublime, surprising win (see Jenson Button for another case in point in F1, or the 2012 Olympics). After months, years, even decades, of the lows you’re rewarded for your loyalty with just a few moments of brilliance. I like to call it the “Inner Tim Henman” in every British sportsman and sportswoman. It’s always worth the wait. He may not be likely to make anyone’s top driver list, but Johnny Herbert was both my favourite goldfish AND my favourite driver. Beat that. 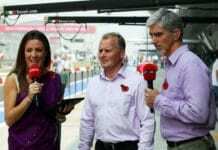 Want another Johnny Herbert fix? Check out our recent interview by clicking here! Previous articleSuper Monaco GP Bash Prizes! Next articleWin the Monaco Grand Prix Circuit!